Please Note: Click on any image for more specific information about it. Details about Madeira can be found on this Wikipedia page.... Madeira Island. Madeira is VERY mountainous so we elected NOT to rent a car but rely on other ways to get around. An interesting feature about Madeira are the number of tunnels, 178 in all. Some were pretty long at over a mile in length. Most had turns within them. One even had an exit tunnel inside of it. The "package" included r/t air for two from Logan in Boston with the departure scheduled for 9:30pm on a Tuesday arriving in the Azores the next morning around 6am. There was a 3 hour layover before catching a "Dash 8" for the 1-1/2 hour flight to Madeira. Both landings were "interesting" and elicited a round of applause from the passengers. There are several ways we could have used to get to Boston but we came across r/t Philadelphia to Boston flights for $130/each so we decided to fly. Our flight got us to Logan around 3:30pm which gave us plenty of time to get our bags, walk to the international terminal, and grab dinner before boarding our 9:30pm SATA Airlines flight. We cleared Portuguese customs in the Azores and waited for our connection to Madeira. We arrived in Madeira around noon and took the included transportation to the hotel. Our return was interesting as well since the Dash 8 flight to the Azores was cancelled. Instead, we flew a Portuguese Airlines (TAP) flight to Lisbon and made a connection there to Boston. Arrival in Boston was late afternoon but we made arrangements to spend the night in Boston and fly home to Philadelphia the next morning. Rather than risk missing a late evening connection to Philadelphia, we elected to spend the night at a nearby hotel and fly home to Philadelphia the next morning. This time around, we stuck with the hotel included in the package without upgrading. We were very pleased with the choice. The hotel had a restaurant which served a fantastic (included) buffet breakfast. We had dinner in the hotel restaurant the first night and, while it was very good, we found it to be the most expensive meal we had all week. There were a number of restaurants downhill from the hotel and we ate the rest of our dinners there. It was a bit of a chore walking back uphill to our hotel so most nights we took a taxi at 5-6 euros which we found to be reasonable. There was a public bus stop nearby which we took advantage of to get into town. We walked into Funchal another day but took a taxi back to the hotel. Basically, we elected NOT to rent a car and focused on taking public transportation which was plentiful and reasonably priced. So, What Did We Do All Week? 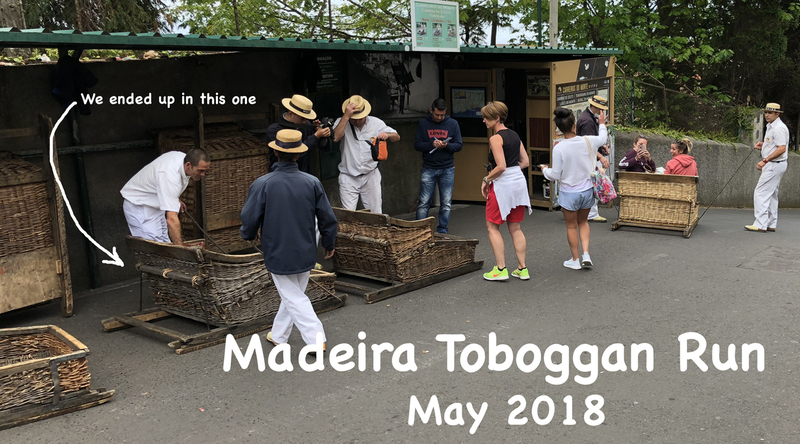 The Toboggan Run: An experience totally unique to Madeira is to ride on a wicker toboggan. This is a tratition started over 100 years ago as a way to move goods down the mountain. Of course, today, it's a tourist attraction. We were a little uncertain about it but it turned into a fun experience. You'll hear some laughter in the background in this video. I should mention that getting to the beginning involves taking a cable car up the mountain. The toboggans only come part way down where there was a line of taxis waiting for passengers. Our thought, "hey, how bad can it be walking downhill into Funchal?" So off we went down a steep and narrow road. So narrow, that we had to step into doorways to let cars come by. Anyway, it wasn't long before BOTH of us were in pain. Our ankles, knees and legs were burning! We were not going to make it and were trying to decide what to do when we heard another car coming down the hill..... I turned and found it was an empty taxi! It was like a big yellow angel from heaven! Totally saved us.